William Murray, 1st Earl of Mansfield PC (March 2, 1705 – March 20, 1793), was a British judge and politician who reached high office in the House of Lords. His most famous judgment was in 1772 in the case of James Somersett. Somersett was an escaped slave brought to England, who had been recaptured and was awaiting shipment to Jamaica. Murray's judgment was that no law could support the injustice of slavery. This case came to have great significance in the United States, as it presented a legal theory for those opposed to slavery. His approach to the law allowed him to take due regard for precedence while also responding to advances in human understanding, such as that slavery was immoral. This is an example of how a slavish adherence to the past, which permitted slavery, which many thought morally acceptable, would have merely perpetuated injustice and immorality in the name of the law. Murray's contribution to the abolition of slavery is not as well known as that of others but is nonetheless praiseworthy and is especially significant in terms of the relationship between humanitarian concern, and the law. Murray was born at Scone in Perthshire, Scotland, a younger son of David Murray, 4th Viscount of Stormont, William Murray was educated at the Perth, Scotland grammar school and Westminster School, which he attended as a king's scholar. He entered Christ Church, Oxford and graduated in 1727. Thomas Foley, 1st Baron Foley, provided for his legal training, and he became a member of Lincoln's Inn on his departure from Oxford, being called to the bar in 1730. He was a good scholar and mixed with the best literary society, being an intimate friend of Alexander Pope. His appearance in some important Scottish appeal cases brought him into public notice, and in Scotland at least he acquired an immense reputation by his appearance for the city of Edinburgh when it was threatened with disfranchisement for the affair of the Porteous mob. His English practice at that point was scant, but in 1737 a single speech in a jury trial of note placed him at the head of the bar, and from this time he had all that to which he could attend. In 1738, he married Lady Elizabeth Finch, daughter of Daniel Finch, 7th Earl of Winchilsea. Murray began his political career in 1742 with his election as Member of Parliament (MP) for [[Boroughbridge (UK Parliament constituency)|Boroughbridge]] and his appointment as Solicitor General. During the next 14 years he was one of the most conspicuous figures in the parliamentary history of the time. By birth a Jacobite and by association a Tory, he was nevertheless a moderate, and his politics were fully dominated by his legal interests. Although holding an office of subordinate rank, he was the chief defender of the government in the House of Commons. During that time William Pitt the Elder was in opposition and to bear the brunt of his attacks. In 1754 he became Attorney-General, and for the next two years acted as Leader of the House of Commons under the administration of Thomas Pelham-Holles, 1st Duke of Newcastle. But in 1756, when the government was evidently approaching its fall, an unexpected vacancy occurred in the chief justice ship of the king's bench, and Murray claimed the office, being at the same time raised to the peerage as Baron Mansfield. From this time the primary interest of his career lay in his judicial work, but he did not wholly separate himself from politics. He became by singular arrangement, repeated only in the case of Lord Ellenborough, a member of the cabinet. Murray remained in that position through various changes of administration for nearly 15 years, and although he persistently refused the chancellorship, he acted as Speaker of the House of Lords while the Great Seal was in commission. During the time of William Pitt the Elder's ascendancy he took but little part in politics, but while Lord Bute was in power his influence was very considerable, and seems mostly to have been exerted in favor of a more moderate line of policy. He was on the whole a supporter of the prerogative, but within definite limits. Macaulay terms him, justly enough, "the father of modern Toryism, of Toryism modified to suit an order of things in which the House of Commons is the most powerful body in the state." During the stormy session of 1770 he came into collision with Pitt the Elder and Charles Pratt, 1st Earl Camden in the questions that arose out of the Middlesex election and the trials for political libel; and in the subsequent years he was made the subject of the bitter attacks of Junius, in which his early Jacobite connections, and his apparent leanings to arbitrary power, were used against him with extraordinary ability and virulence. During 1754, Murray purchased Kenwood House and he had extensive modifications made by Robert Adam. After his Bloomsbury house was burned in the Gordon Riots in 1780, he lived exclusively at Kenwood. In 1776, he was created Earl of Mansfield. In 1783, although he declined to re-enter the cabinet, he acted as Speaker of the House of Lords during the coalition ministry, and with this his political career may be said to have closed. He continued to act as chief justice until his resignation in June 1788, and after five years spent in retirement, Murray died on March 20, 1793. He left no family, but his titles of 1776 and 1792 devolved upon his nephew's wife and his nephew, David Murray, 7th Viscount Stormont (1727–1796), respectively. Stormont became ambassador to Vienna and then to Paris; he was Secretary of State for the Southern Department from 1779 to 1782, and Lord President of the Council in 1783. He supported Lord Camden's decision against general warrants, and reversed the outlaw sentence on John Wilkes. He was always ready to protect the rights of conscience, whether they were claimed by Dissenters or Catholics. The popular fury which led to the destruction of his house during the Gordon riots was mainly due to the fact that a Catholic priest, who was accused of saying Mass, had escaped the penal laws by his charge to the jury. His chief celebrity, however, is founded upon the consummate ability with which he discharged the civil duties of his office. James Somerset, a slave brought to England by his master, a Mr. Stewart of Virginia, brought suit against him on May 14, 1772. Lord Mansfield rendered his verdict in favor of Somerset on June 22, 1772. "On the part of Somerset, the case which we gave notice should be decided, this day, the Court now proceeds to give its opinion. The state of slavery is of such a nature, that it is incapable of being introduced on any reasons, moral or political; but only positive law, which preserves its force long after the reasons, occasion, and time itself from whence it was created, is erased from memory: it's so odious, that nothing can be suffered to support it but positive law. Whatever inconveniences, therefore, may follow from a decision, I cannot say this case is allowed or approved by the law of England; and therefore the black must be discharged." Mansfield concluded that there was no legal backing for slavery in England. Furthermore, the Somerset case is the origin of the following words about English common law (although Mansfield himself never said them), the words have been memorized by British pupils ever since. "... one Cartwright brought a slave from Russia and would scourge him; for which he was questioned; and it was resolved, that England was too pure an air for a slave to breathe, and so everyone who breathes it becomes free. Everyone who comes to this island is entitled to the protection of English law, whatever oppression he may have suffered and whatever may be the colour of his skin." This ruling applied only to England, and not the rest of the British Empire, and British commerce in slaves continued for 35 years until 1807, when Parliament formally abolished the slave trade. From Lord Mansfield's ruling in this case comes also the famous quote, "Let Justice be done, though the Heavens may fall" which has been ascribed to Lucius Calpurnius Piso Caesoninus (d. 43 B.C.E.) in the form "Fiat justitia ruat coelum." Since the ruling did not apply to British colonies, slavery remained in the future United States. However, the decision was used by American abolitionists to justify personal liberty laws, and was overturned in the United States by the 1843 Supreme Court decision of Prigg v. Pennsylvania. Mansfield's nephew John Lindsay had a daughter, Dido Elizabeth Belle, whose mother was a slave, and Dido lived with Mansfield at Kenwood house. He was careful to confirm her freedom from slavery in his will in which he left her a legacy of £100 anually. Lord Mansfield's role in an important decision in formation of copyright law is seen as uncharacteristically short-sighted. In Millar v. Taylor, Mansfield held in favor of an English publisher, who argued that a common law right to copyright continued after the limited term granted under the Statute of Anne expired. While his decision in the case is seen as a logical deduction, it is criticized for ignoring the context of the Statute of Anne as a response, following the English Civil War, to the monopolies of the Crown. By upholding a common law right to copyright, Mansfield ruled in favor of a copyright that would never expire and sidestepped the intent of the Statute of Anne to create a public domain. Mansfield's ruling was overruled in a later decision by the House of Lords, Donaldson v. Beckett. Murray's health deteriorated forcing him to resign in 1788, and he devoted his last days to horticulture, and studying classics. He died in 1793. 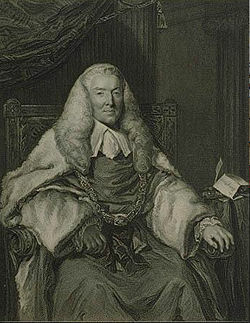 Lord Mansfield's great reputation rests chiefly on his judicial career. The political trials over which he presided, although they gave rise to numerous accusations against him, were conducted with singular fairness and propriety. He was accused with especial bitterness of favoring arbitrary power by the law which he laid down in the trials for libel which arose out of the publications of Junius and John Horne Tooke, and which he reaffirmed in the case of the dean of St. Asaph. His view of the law was in concurrence with the great majority of the judges and lawyers of his time, and was supported by undoubted precedents. In other instances, when the government was equally concerned, he was wholly free from suspicion. He is widely recognized as the founder of English mercantile law. The common law as it existed was wholly inadequate to cope with the new cases and customs which arose with the increasing development of commerce. The facts of the case were left to the jury to decide as best they might, and no principle was ever extracted from them which might serve as a guide in subsequent cases. Mansfield found the law in this chaotic state, and left it in a form that was almost equivalent to a code. He defined almost every principle that governed commercial transactions in such a manner that his successors had only to apply the rules he had laid down. His knowledge of foreign and Roman law, and the general breadth of his education, freed him from the danger of relying too exclusively upon narrow precedents, and afforded him a storehouse of principles and illustrations, while his grasp and acuteness of intellect enabled him to put his judgments in a form which almost always commanded assent. A similar influence was exerted by him in other branches of the common law. Although after his retirement, a reaction took place and he was regarded for a while as one who had corrupted the ancient principles of English law. These prejudices passed rapidly away, and the value of his work in bringing the older law into harmony with the needs of modern society has long been fully recognized. This page was last modified on 15 September 2014, at 13:58.